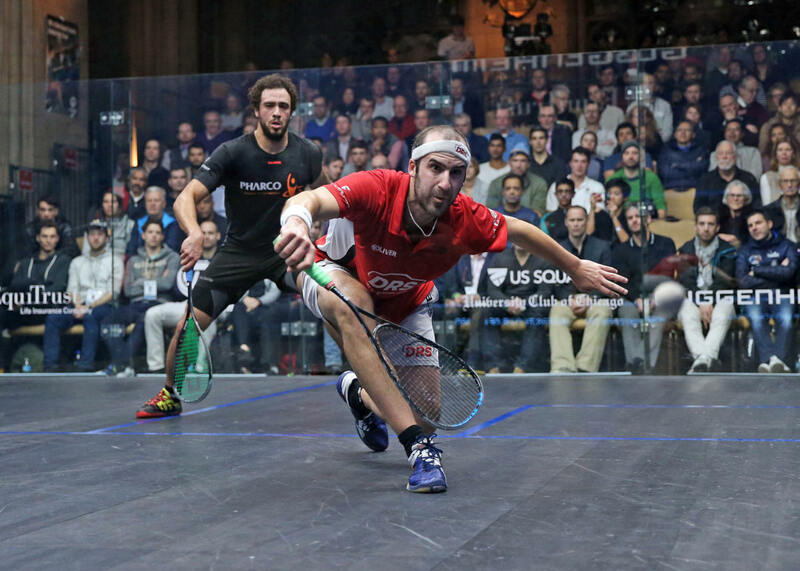 French World No.3 Gregory Gaultier picked up the 36th title of his PSA World Tour career by defeating Marwan ElShorbagy 3-1 to win the 2017 Windy City Open presented by Guggenheim Partners & EquiTrust Life Insurance Company - while Egyptian Women's World No.3 Raneem El Welily added the 2017 title to her 2015 and 2016 crowns with a 3-1 win over Nour Sl Sherbini. The Frenchman started slowly, looking nervous as he struggled to settle in an opener which went the way of a composed looking ElShorbagy. 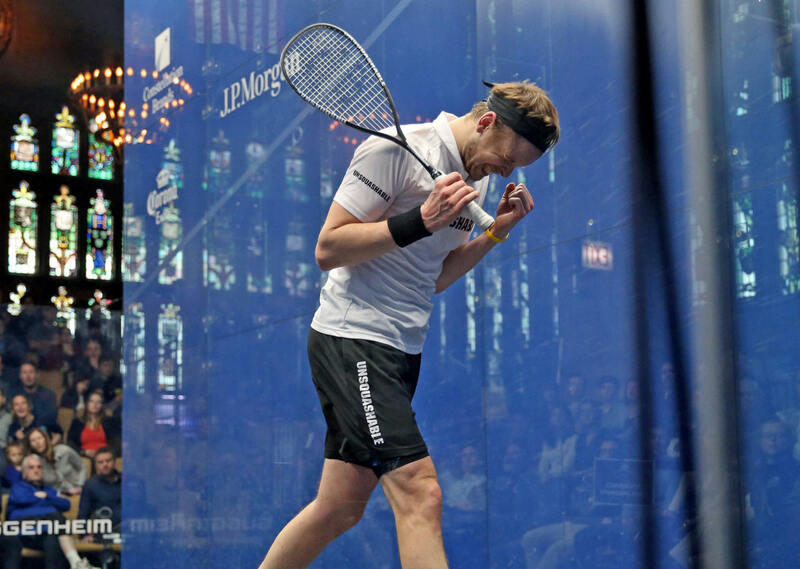 But Gaultier's big game experience came to the fore as he pushed on to secure the honours and his 13th PSA World Series title 5-11, 11-8, 11-2, 11-4. "I am really happy - it's amazing to win these kind of major titles so it will be nice to see my name on this beautiful trophy once again," said Gaultier, who also won here in 2014. "It is a lovely place to play and I have been coming here for a long time. I have a lot of friends here and have always enjoyed coming back. "Today he caused me a lot of trouble in the first game. He has got a lot of confidence from this week winning some big matches, especially from beating his brother the World No.1. He proved this week that he is a top player - he came through five tough matches to reach this stage which, was a tougher week than me. "I had to find a solution and to put more pace into it and get in control because when I was playing at his rhythm he was just a better player than me." El Welily meanwhile, in a repeat of the 2016 final, put in the best performance of her year so far to stop World No.1 El Sherbini 10-12, 11-7, 11-7, 11-7. The World No.3 played superb squash from the off, using her backhand drop with devastation to punish any lose play from El Sherbini. Despite losing a close first game 10-12 it looked comfortable for El Welily as she returned to the form that took her to World No.1 in 2015. 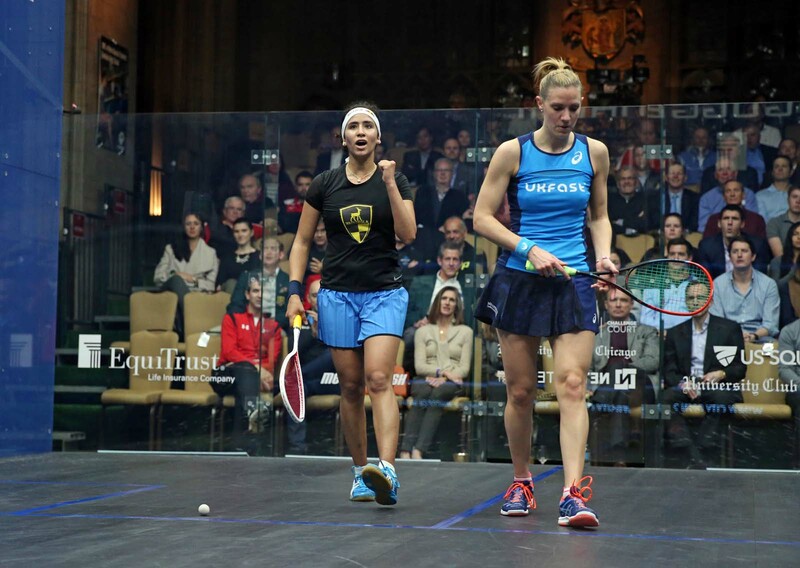 “I’m very, very happy, it’s fantastic to win here again for the third time,” said El Welily. “I’m glad with how I performed after a tough match yesterday and I didn’t really expect to play that well. She played really well in the first game and I wasn't sharp enough. “But half way through the first I started to find my spots and my angles. Even though I lost it I knew that I was on my way to finding the right plan. During the trophy presentation it was announced the the 2018 Windy City Open will become the most lucrative PSA World Tournament ever, boasting a $500,000 prize fund that will be split equally between Men and Women. 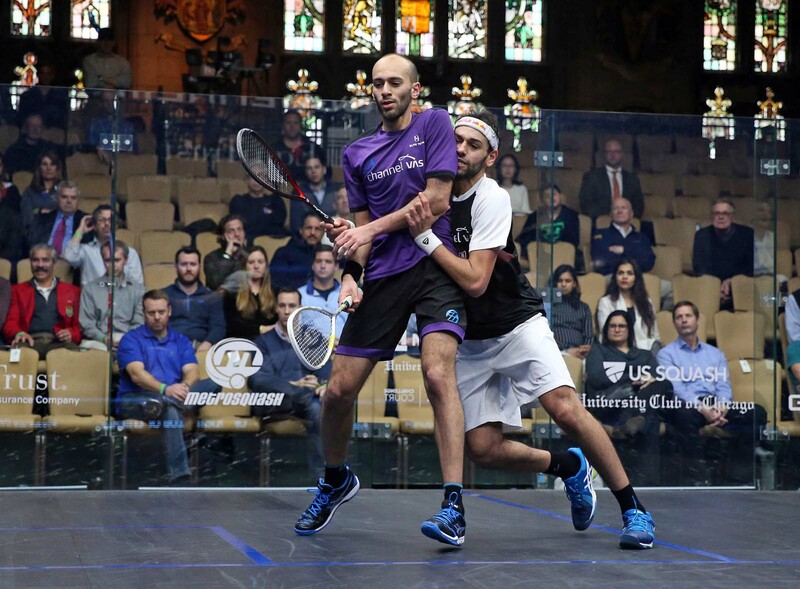 Egypt's Marwan ElShorbagy will compete in a PSA World Series tournament final for the first time ever tomorrow (March 1) when he will look to put his name alongside that of elder brother Mohamed ElShorbagy on the winners board at the Windy City Open presented by Guggenheim Partners and EquiTrust Life Insurance Company. After defeating his elder brother, the World No.1 and 2016 tournament winner, in an emotional quarter-final yesterday ElShorbagy regrouped and came through a last four encounter with Ali Farag 11-8, 11-9, 8-11, 11-9. 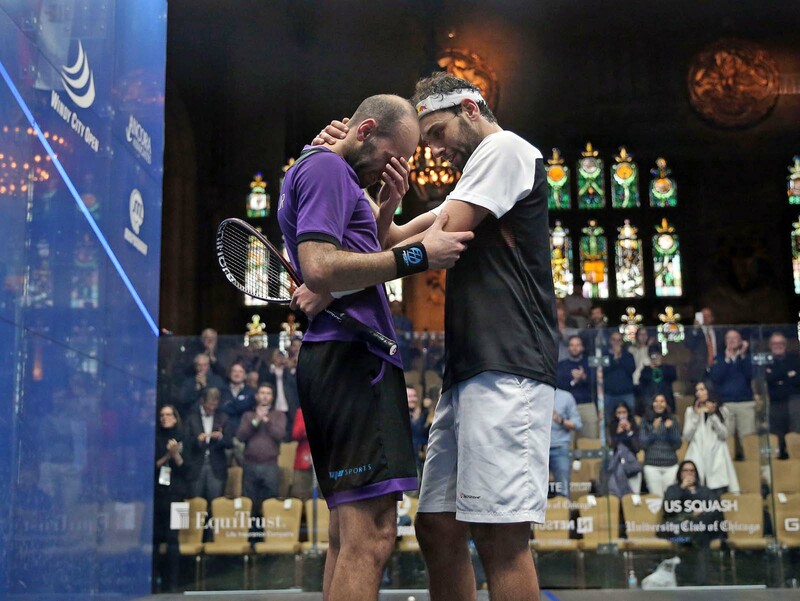 "It was very hard to back up what happened yesterday - emotionally, mentally and physically," said ElShorbagy. "I didn't sleep very well last night and I tried to stay away from my phone - there was a lot of messages on social media. "But my brother called me before the match today and helped me prepared me for it - he gave me the game plan and told me that these opportunities, once you get them you have to take them. I felt ready for it because of him. "I've had some good wins so far to reach the final but I want to keep it going. I really want that title and I'll give it everything that I have tomorrow." Golan began where he left off in yesterday's hugely impressive victory over World Champion Karim Abdel Gawad, played high level, patent squash to frustrate Gaultier and embroil the Frenchman in a battle of attrition which left Gaultier cutting an increasingly frustrated figure. "It was a really intense match - we were both playing well," said Gaultier. "It's great to see Borja back in good shape after his injuries and the second game was unbelievable. It could have gone either way but I took the momentum with me into the third. "I'm feeling like I'm in great shape and I'm looking forward to tomorrow. I've been playing well all week and haven't played many long games so there's still a lot left in the tank." 2015 and 2016 Women's champion Raneem El Welily's kept alive her hopes of completing a Chicago-three-peat by winning a mammoth battle with 19-year-old World No.4 Nouran Gohar. "Today at the end, there was so much relief - it was so intense," said El Welily. "She played fantastic. I'm just very happy to be through. It's a very important win for me mentally. "I love it here in Chicago. It's amazing to be in the final for a fourth time - there's no pressure tomorrow but it would be fantastic to win here for the third time." El Welily will face World No.1 Nour El Sherbini in the title decider - a repeat of the 2016 final - after the 21-year-old signalled a return to her top form with an impressive 3-1 win over Camille Serme, ending the Frenchwoman's 12 match winning streak in the process. El Sherbini looked out of sorts during January's Tournament of Champions but cut an entirely different figures on court in a superb 8-11, 11-3, 11-6, 11-4 come from behind victory. "It feels like things are coming together this week - I regrouped after ToC and trained very hard the past few weeks," said El Sherbini. "I feel like I'm playing well again and I'm trying to enjoy being out there. I'm happy more with the fact I'm playing well than with the win. "There are no expectations for me tomorrow - I'll do my best to win. I'm happy to be back in the final, I love playing here and I'm really happy that it's going to be an all-Egyptian final." World No.1 Mohamed ElShorbagy saw his hopes of winning the 2017 Windy City Open presented by Guggenheim Partners & EquiTrust Life Insurance Company for the second consecutive year dashed at the hands of younger brother, and World No.6, Marwan ElShorbagy in Chicago today (Feb 27) - while World Champion Karim Abdel Gawad also suffered a shock defeat to 34-year-old Borja Golan. 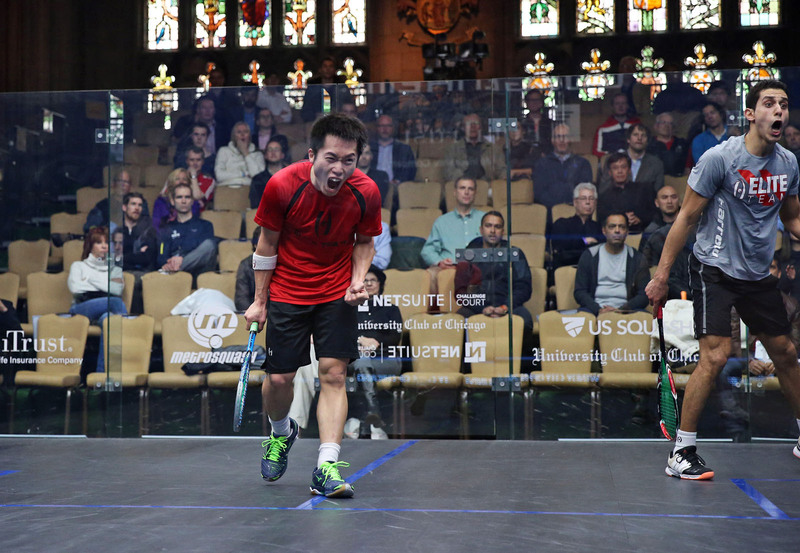 On seven previous attempts 23-year-old Marwan had failed to take more than a solitary game from 26-year-old Mohamed but, under the chandeliers of the University Club of Chicago, he fought through the mental barrier to come through a compelling five-game battle 1-11, 11-8, 13-11, 5-11, 11-8. It was Mohamed who started stronger, taking the first game 11-1 as he set a blistering pace. But Marwan responded, mixing up the pace and using deception in the front court to level before going on to seal the match, ushering an outpouring of emotion from both. "It's tough - we both new it was going to happen at some point," said Marwan. "Every time we play it's a battle on court - but we are best friends off court. I'm grateful for the sport - it has allowed me to have my brother as my best friend. We share the same life, have the same dreams and we support each other. "We're there for each other. It's a tough day today for us. But I have a big match tomorrow to look forward to and a chance to reach a first World Series Final." Mohamed ElShorbagy's main contender for the number one spot atop the World Rankings, Gawad, came into Chicago bidding to win a third straight PSA World Series title but found himself up against an inspired Golan - who will compete in a major semi-final for the first time since the 2014 Hong Kong Open after winning 8-11, 11-4, 11-9, 11-9. Prior to the tournament the Spanish former World No.5, and current World No.21, hadn't won a match for six months following a back injury but produced a tactically superb display to take Gawad out of his comfort zone and seal the match after 73 minutes. "I had a back injury and a few months ago I didn't know if I'd be able to play again - I was 34 and my back wasn't responding well," said Golan. "I kept doing the work and I was so happy to get back on court last year. But I hadn't won a match until this week and I think that match winning confidence is so important to help you increase your level. "And today I had nothing to lose. I knew I'd have to be at my best and I took the opportunities. I defended well and tried to be very aggressive as well and change the pace, and it worked. "Tomorrow is another match. I want to enjoy this one - eat well and sleep well and then I'll worry about the next one. There's no point playing if you can't take some time to enjoy the win." In the Women's draw an Egyptian finalist is guaranteed after the trio of Nour El Sherbini, Raneem El Welily and Nouran Gohar came through to join the in-form Frenchwoman Camille Serme in the last four. After stuttering early in the tournament Gohar secured an eye-catching 3-0 win over former World No.1 Laura Massaro courtesy of a dominant performance that saw her control proceedings from the start and leave Massaro powerless to halt the charge. "In the first round I didn't think my shots were going well and I didn't feel like I was moving very well," said 19-year-old Gohar. "But I've stuck to the plan and been improving with each match. "I tried to make sure I stayed positive. My mum was with me reminding me that I've trained very hard in the past few weeks. "But even at 2-0 today I knew I had to stay fully focused because she can come back. She's so strong mentally, so I'm very happy to have come through." 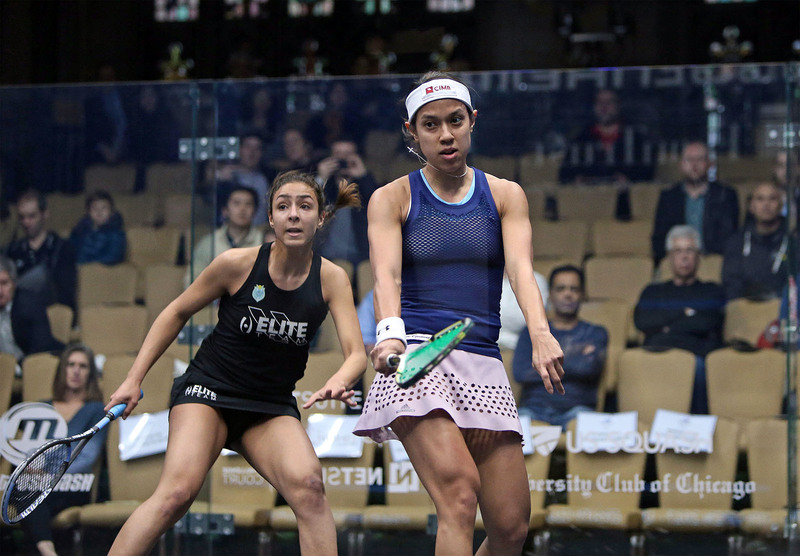 Gohar (right) will face defending champion El Welily while El Sherbini will face Serme, who extended her unbeaten run to 12 matches, after recording a seventh straight victory over eight-time World Champion Nicol David. "I've watched Nicol since I was six years old and I've learnt a lot from her," said El Sherbini. "She's always difficult to play against - she fights for everything and never gives up. It is always very tough and she brings the best out of me but I am happy that I am through." World No.6 Amanda Sobhy - the highest ranked U.S.-born player ever - emerged victorious in a momentous all-American encounter with Olivia Blatchford today (Feb 26) to reach the quarter-finals of the 2017 Windy City Open presented by Guggenheim Partners & EquiTrust Life Insurance Company. 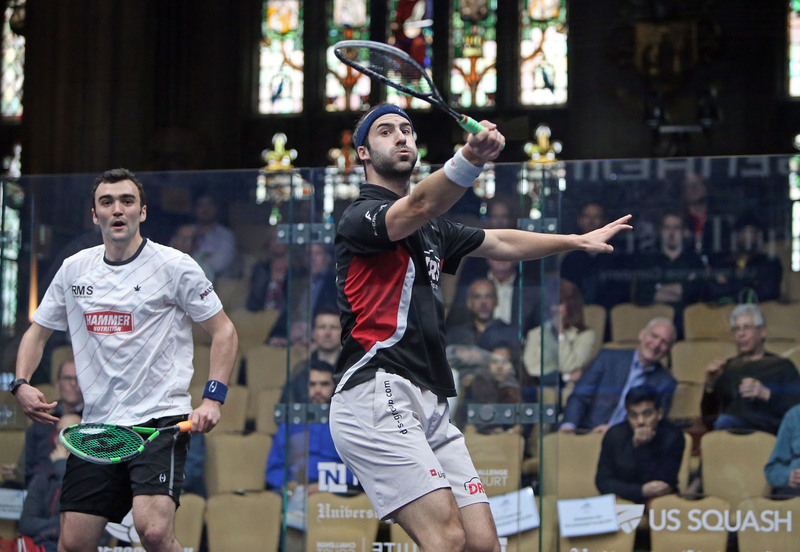 23-year-old Sobhy, in the first meeting this century between two US-born players this deep into a PSA World Series tournament, came through in four games against 24-year-old Blatchford, having been made to work hard for the win by the World No.26. After taking the first comfortably Sobhy found herself drawn into a real battle as Blatchford upped her game to take the second 12-10 in a tie-break. And Sobhy could have gone behind in the third, managing to get out of trouble and take it 12-10 before sealing the win with a one-way 11-3 fourth game. 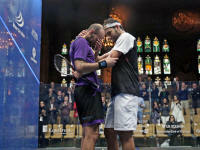 "It was difficult mentally out there against a good friend," said Sobhy. "I got a bit edgy when things where getting close. She played well in the big points and I was really bummed to lose the second game. I finally felt like I relaxed in the fourth so hopefully I can play the whole match tomorrow like that. "But I enjoyed the match today. It's great to have two US players at this stage of a major event. It shows that we can produce the talent so hopefully we will see more of it in the future." 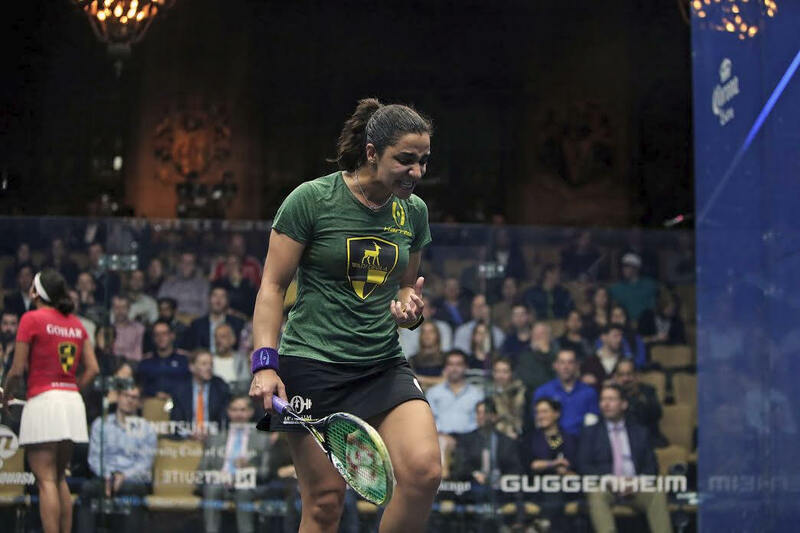 Sobhy will take on 2016, and 2015, tournament winner Raneem El Welily, the Egyptian former World No.1, for a place in the semi-finals after she downed Hong Kong's Annie Au with little difficulty. 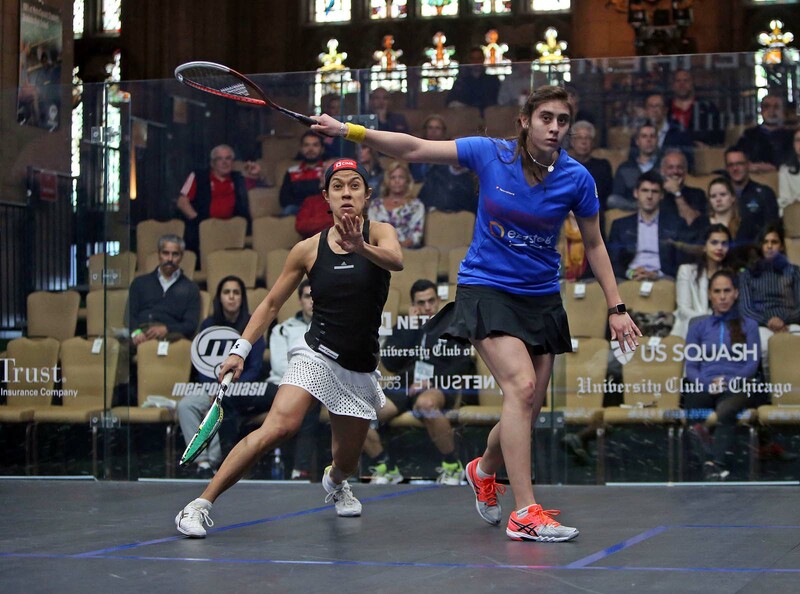 Joining them in the last eight were 2014 tournament winner Laura Massaro and World No.4 Nouran Gohar (left) - who had to come from behind to defeat the in-form Sarah-Jane Perry. The Englishwoman, who broke into the top ten for the first time in her career last month, took the opening game 11-6 and enjoyed periods of control. But Gohar stayed calm, applied pressure through her hard-hitting style and was rewarded when Perry slowed up physiclaly n the third, setting the platform for the win. 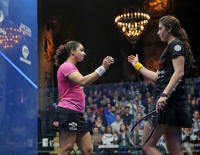 "It was a big battle, she's in-form at the moment and I'd never beaten her before," said Gohar. "I had to play very well today. She's just made the top 10 so I had to be 100 per cent ready mentally and physically. "In the first game it was all her - I just tried to stick in there and dig deep to win the match." 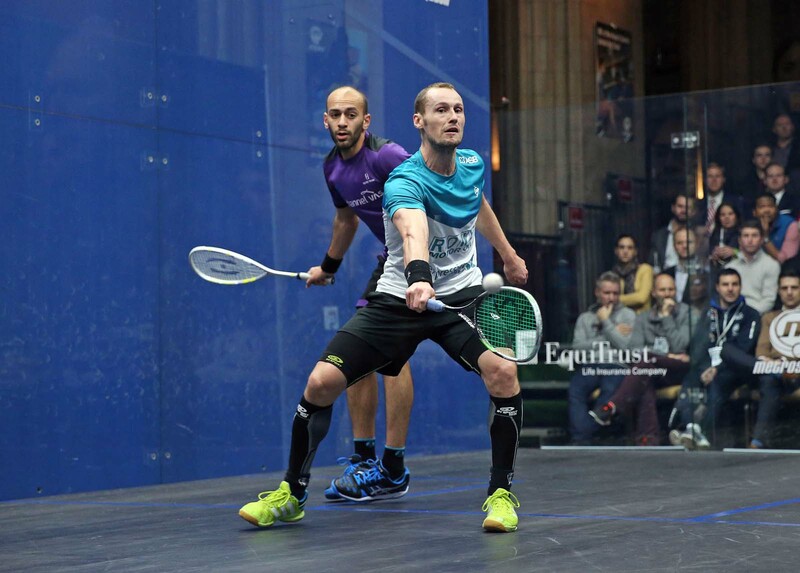 In the Men's draw another in-form English player, James Willstrop, came out victorious against Egyptian opposition, coming through a tough and testing match with Mohamed Abouelghar to set up a quarter-final with 2015 World Champion Gregory Gaultier. Willstrop demolished Omar Mosaad 3-0 in round one and picked up from where he left off as he continued to hit accurate, precise lines and leave Abouelghar powerless to resist as he took a 2-0 lead. 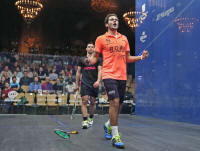 But Abouelghar's top fifteen calibre was on full display as he reduced the error count, tightened up his line hitting and played with patience to transform the match into an almighty tussle. He took the third and was enjoying success in the fourth until 9-9, when Willstrop's beautifully deceptive crosscourt kill set up match point - although he needed two more to convert the win. "There was a lot of relief at the end of that one - it was very hard," said Willstrop. "He was very heard to break down today. I might have a ranking advantage and the experience, but he's given me a real tough ride the last few times we played. "I handled it well in the first two today but he just got better and better and grew into it. I though he was class - he was making it very, very hard and wasn't giving me any openings. I'm very happy that I managed to get through it." 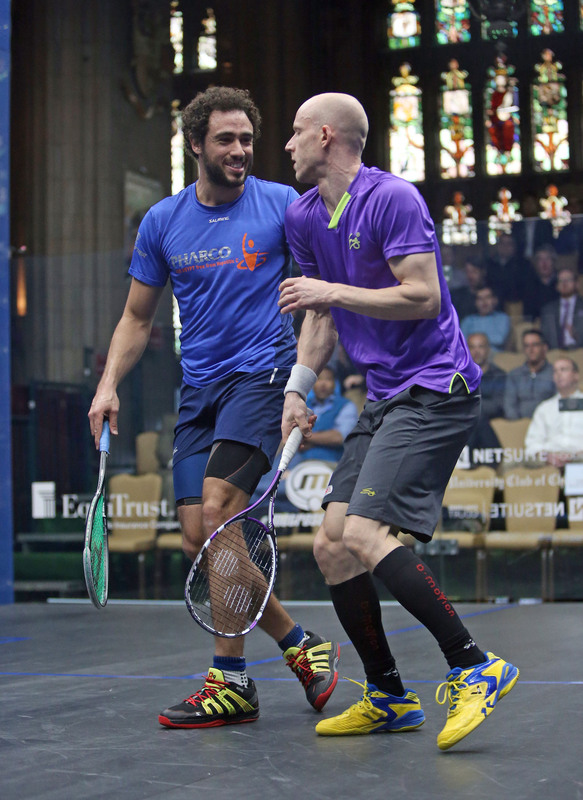 The winner of Willstrop's encounter with Gaultier will face either Spaniard Borja Golan, who beat Leo Au to reach his first World Series quarter-finals in over a year, or current World Champion Karim Abdel Gawad (left). 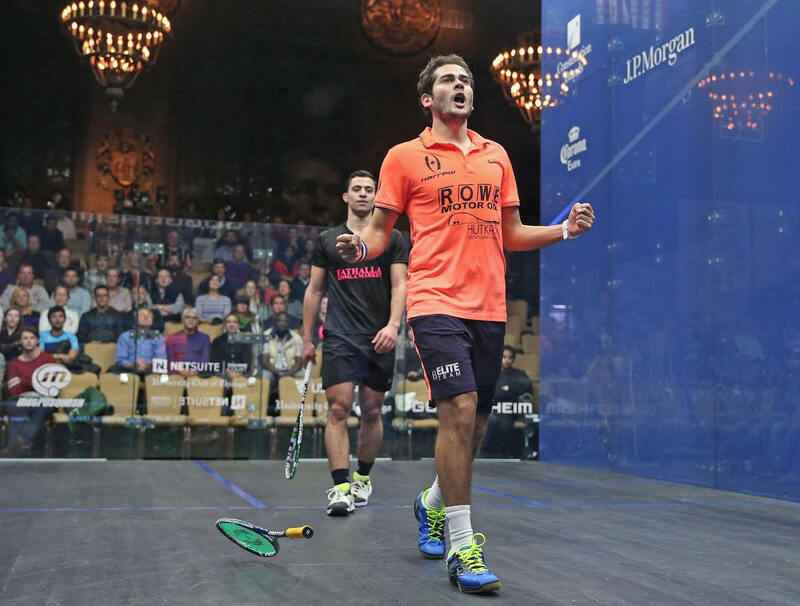 The Qatar Classic and Tournament of Champions winner beat compatriot Fares Dessouky in a hard fought 3-1 encounter to return to wining ways after losing to Gaultier in the Swedish Open final earlier this month. "I really want to do well in this event and keep my performances high and get the winning going," said Gawad. "I went on court very focused and trying to start strong and I feel like I played very well today. I felt like I kept my rhythm and focus going throughout the game which is pleasing. "You can't win every match but the most important thing I believe is to always try and learn from your mistakes. I lost in Sweden but I've tried to work on what I did wrong and come into this tournament as if it is the first one of the season." 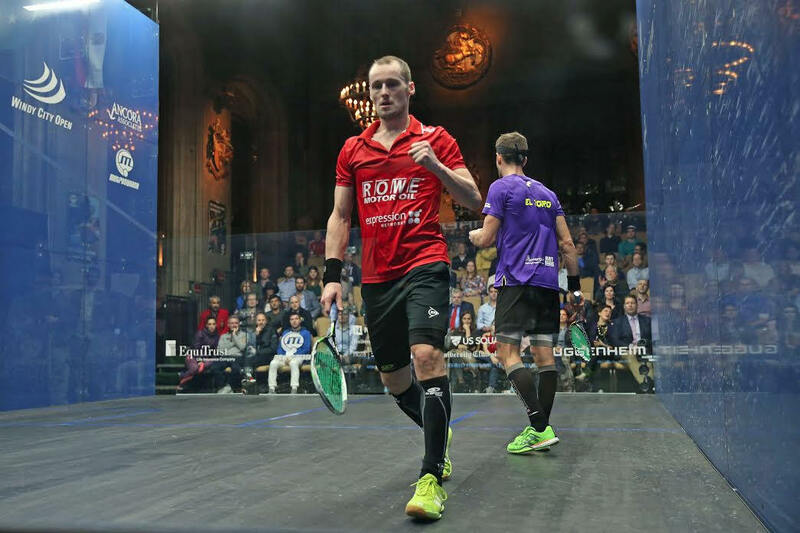 An inspired Simon Rösner put together one of the best performances of his career to date to secure a huge win over World No.5 Ramy Ashour and move into the last eight of the 2017 Windy City Open presented by Guggenheim Partners and Equitrust Life Insurance Company. Despite trailing 0-6 in their head-to-head coming into today's encounter Rösner was unfazed by the maverick three-time World Champion and came out with all cylinders firing as he attacked with abandon from the off. The 29-year-old German hit winner after winner as he took the opening game and could do no wrong as he stormed into a 9-0 lead in the second. 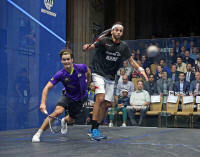 Ashour, in his typically flamboyant style, roared back into contention and, after narrowly losing the second 11-8, took the third to give himself hope. But it was Rösner, who's forehand drop in particular proved to be a valuable weapon, who kept calm to claim the fourth and set up a quarter-final encounter with Ali Farag. "That's one of, if not the, biggest wins of my career," said Rösner. "You never know what to expect from Ramy - he's such a unique player. I think he played well today but I managed to keep him away from the centre of the court and it was one of those days where you step on court and have a good feeling. "My front corner game was working very well and everything was clicking. I knew I had to be aggressive and go for it and I think every aspect of my game together today - and that's what you need to do to beat a player like him. "I'm very happy with the match and I think that's one of the best performances of my season. I'm very proud to be back in the quarter-finals here." 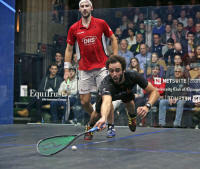 The winner of Rösner's encounter with Farag will face one of the ElShorbagy brothers in the last four after World No.1 Mohamed gained revenge on Cesar Salazar - after losing out to the Mexican in the first round of last month's Motor City Open - winning 3-0 with World No.6 Marwan caming through a bruising five-game encounter with South African Stephen Coppinger. After taking the first Marwan found himself embroiled in a battle of attrition with Coppinger and had to save three game balls in the third to regain the upper hand, before gritting his teeth to squeeze through in five. 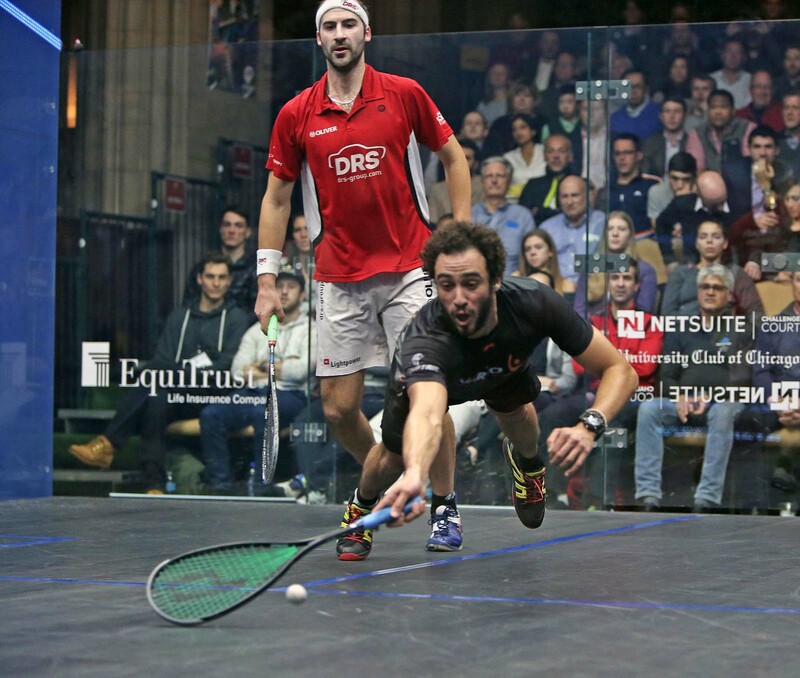 "To be honest I don't know how I won that one today," said Marwan, who is yet to beat elder brother Mohamed on the PSA World Tour in seven attempts. "In the third game he was 10-7 up and I just started to go for it. I think he started slowly in the first game but in the second he was controlling the pace. "I was just digging in there. It was very tough. I'm just very happy to have won and got through and to have a day off to recover." In the Women's draw in-form Camille Serme also scraped through her second round match against Tesni Evans, winning 3-1 to keep up her unbeaten start to 2017. 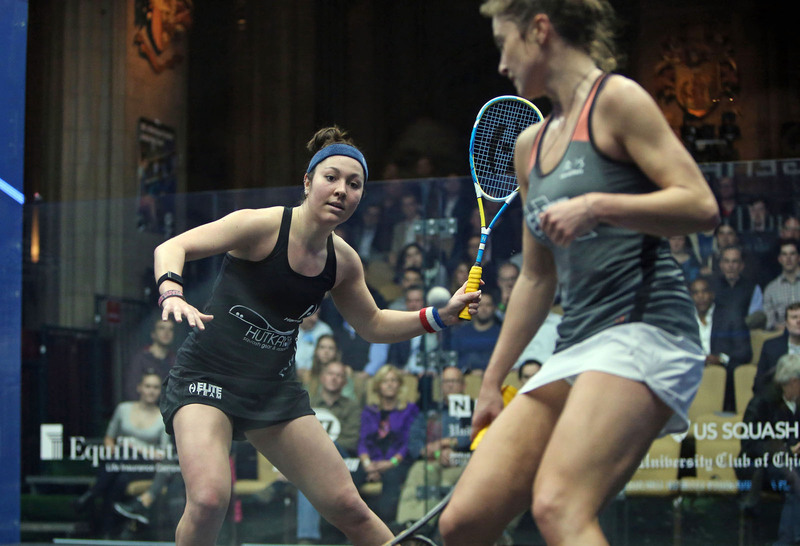 Serme won both January's Tournament of Champions and the recent Cleveland Classic and recorded an 11th straight victory when she came from behind to defeat World No.21 Evans, after the Welshwoman had put together one of the most impressive performances of her season so far. Evans looked like a top five contender as she took the match to Serme from the off, at times exposing Serme's traditionally strong backhand, but the 27-year-old showed the qualities of a champion as she fought back to save two game balls in the fourth and prevail 8-11, 11-8, 11-6, 13-11. "It's a big relief to get that win," said Serme. 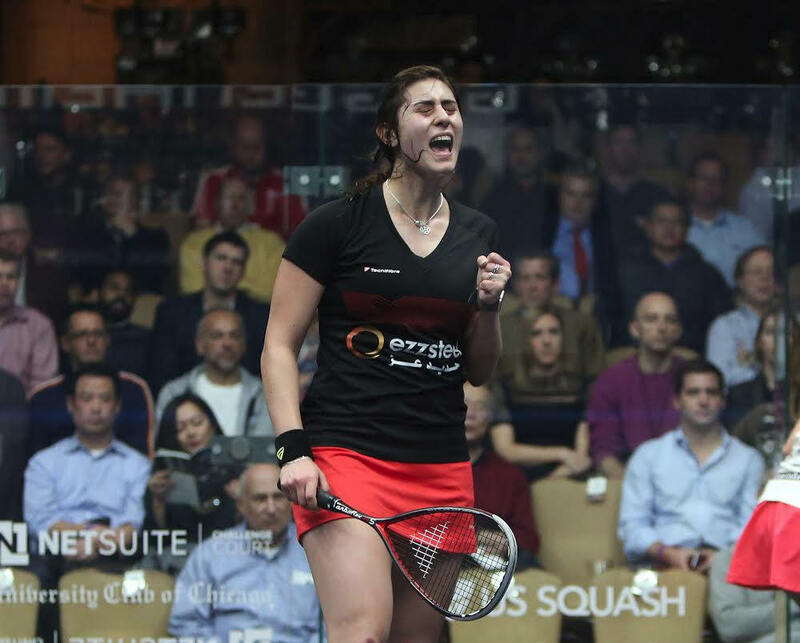 "She had a big win in the first round against Nour El Tayeb and we always have big battles on court. I'm just really happy to get through it in four. "I felt like I would have been the fresher of us if it went to five but I knew I had to try and not give her anything at 8-10 in the fourth. Anything can happen in the fifth game so I tried to make her earn it. "I'm happy with how I stuck at it and came back and I'm excited to be in the quarters now." Serme will face England's Alison Waters for a place in the semi-finals while former World No.1 Nicol David and current No.1 Nour El Sherbini are set to lock horns in a repeat of last year's quarter-final - when it was El Sherbini who triumphed in one of six consecutive victories over David stretching back to 2015. America's top two players Amanda Sobhy, World No.6, and Olivia Blatchford, World No.26, will go head to head in the second round of the 2017 Windy City Open presented by Guggenheim Partners and Equitrust Life Insurance after prevailing in their first round encounters inside the University Club of Chicago today (Feb 24). 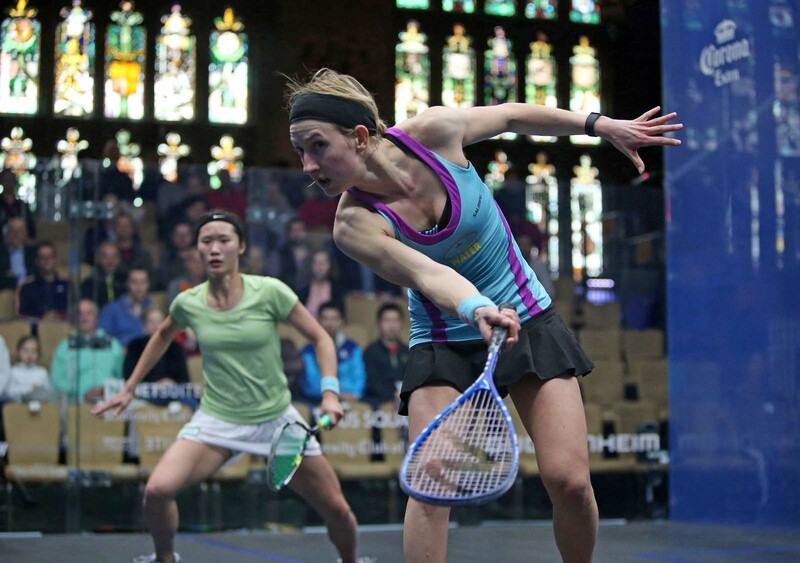 Blatchford, the 5ft 0in 24-year-old, recorded one of the biggest wins of her career as she downed India's World No.14 Joshna Chinappa 3-0, marking the first time she has ever reached the second round of a PSA World Series tournament - the highest tier tournament in professional squash. The tournament Wildcard twice saved game ball in the first to take it 13-11 in the tie-break and from then on she played without pressure, controlling the court to secure a highly impressive 13-11, 11-4, 11-5 victory. "That's a massive win for me - especially as I came into this tournament as the wildcard," said Blatchford. "It's a huge confident boost. She's a top 15 player, so to come in and win in three is a fantastic feeling and to be in the second round, and have another chance to play on the glass court at this stage, can only bode well for me in the future. "The first game was huge. I think had I lost that one then the match would have been a completely different story. I don't think I played well in the first game but I managed to stick in there and get through it and that allowed me to go into the second very positive." Sobhy, a quarter-finalist here last year, meanwhile took just 20 minutes to defeat Belgian World No.35 Nele Gilis in a comprehensive 11-5, 11-3, 11-1 win that saw her drop just nine points en route to victory. The 23-year-old stuttered on her last outing at the Tournament of Champions in New York, when a partially torn fascia on the bottom of her right foot contributed to a disappointing second round exit, but she looked to have put at least some of her injury worries to bed as she dominated proceedings against Gilis. "I'm very happy with the win today," said Sobhy. "I had, and have, no expectations coming into this tournament, I just wanted to play at least semi pain-free because my foot is doing a lot better. "So I just told myself to enjoy it and have fun and that's what I did and I'm happy I took it 3-0 and conserved as much energy as possible." "To be playing Olivia in the next round is super exciting," added Sobhy. "I was pumped for her when she won today and I think she's playing well at the minute and could give a lot of players a run for their money - it's a little annoying that it has to be me who plays her next round. "We haven't played for a while and the pressure will be on me because I'm the higher ranked, but it's just awesome to have two Americans at this stage in a World Series event - hopefully this is a trend that will continue in the future." 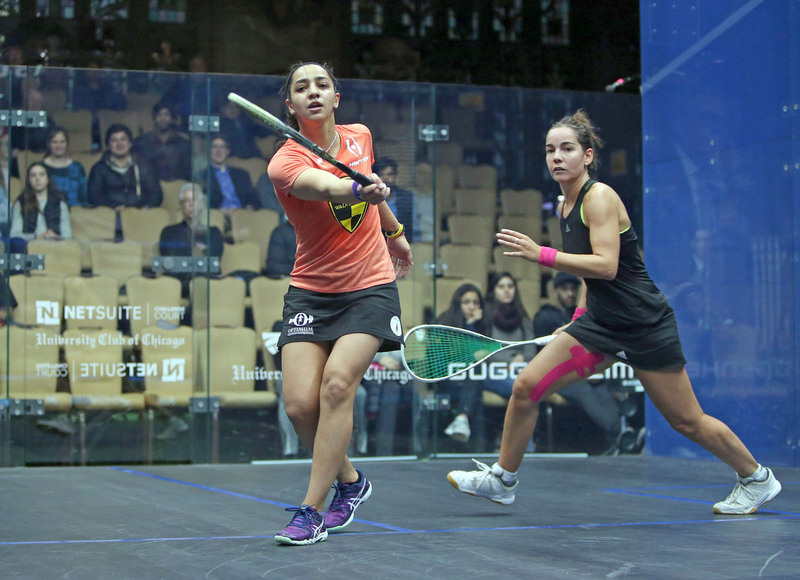 Defending Women's champion Raneem El Welily and England's former World No.1 Laura Massaro were other notable winners while in the Men's draw Hong Kong's Leo Au pulled off the shock of the day as he won a superb five-game thriller against World No.8 Tarek Momen. Overcoming 25 places on the World Rankings, Au matched Momen throughout the encounter, with his lob and drop style of play frustrating the Egyptian and tempting him into hitting winners from all angles - subsequently making too many errors and allowing Au to take advantage. "I think I had an easy run in qualification when Raphael (Kandra) withdrew injured and that allowed me to save some energy and focus on this match today - and I just wanted to play my best out there," said Au. "In the first game he started very well and was very sharp and focused but I just tried to get back to my game. "Then when it got close in the last game, I really wanted to win it. I just tried to focus on each point and doing what I had to do to win each one. "I'm excited to come back for the second round now and give it my best shot." 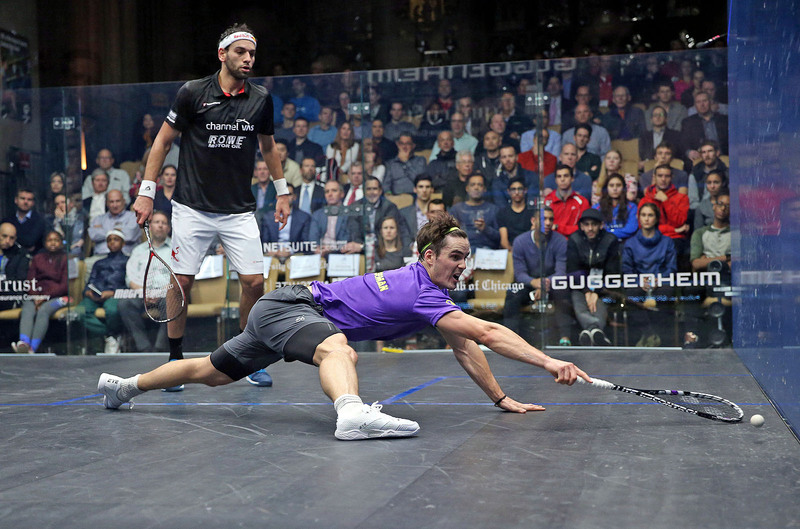 Momen's compatriot Omar Mosaad, the 2016 World Championship runner-up, also crashed out at the first hurdle as he fell victim to a masterclass performance from James Willstrop. The 33-year-old Englishman rolled back the years as he made light of the two-place difference between them on the World Rankings, living up to his 'Marksman' moniker to slot home winner after winner, striking cleanly and precisely, leaving Mosaad powerless to defend. "I had to be very focused because Omar is a very tough first round draw so I was ready for him," said Willstrop. "If felt like everything was coming off out there. Sometimes it works like that. I'm feeling good and striking the ball well so I can't be anything but happy with that. "I'm not getting ahead of myself though. I just try and go day and day, recover and train well. I've enjoyed coming here over the years - it's a very enclosed and intimate venue." 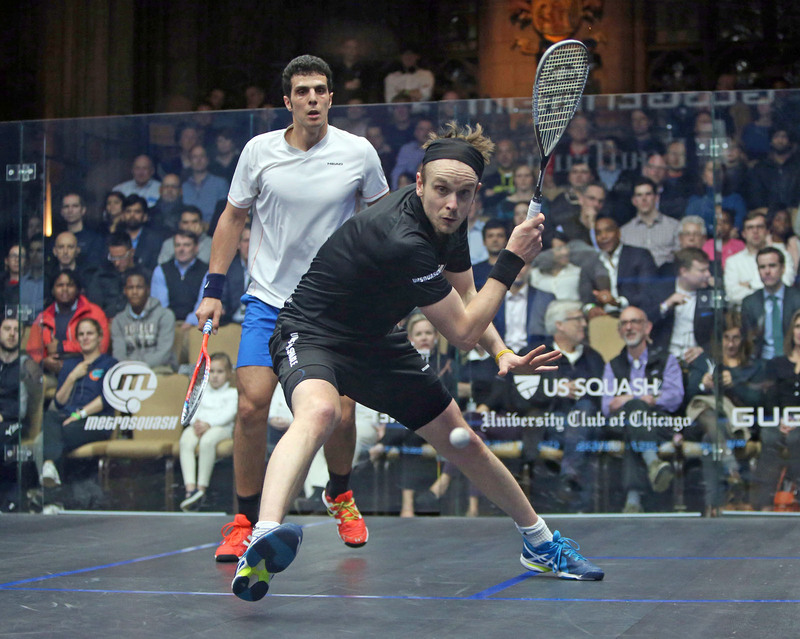 Defending champion Mohamed ElShorbagy began his 2017 Windy City Open presented by Guggenheim Partners and EquiTrust Life Insurance Company campaign with a winning start, coming through an epic 94 minute battle with New Zealand's Paul Coll in one of the best matches ever seen inside the University Club of Chicago today (Feb 23). The duo engaged in rally after rally of attritional, high quality squash from the off but it was the World No.1, after saving two game balls in the opener, who looked to be on his way to a routine straight games win after going 2-0 up. Coll though showed the skills, determination and physical strength that has catapulted him into the Top Twenty as he fought back in style, taking the third and fourth games to force a decider. 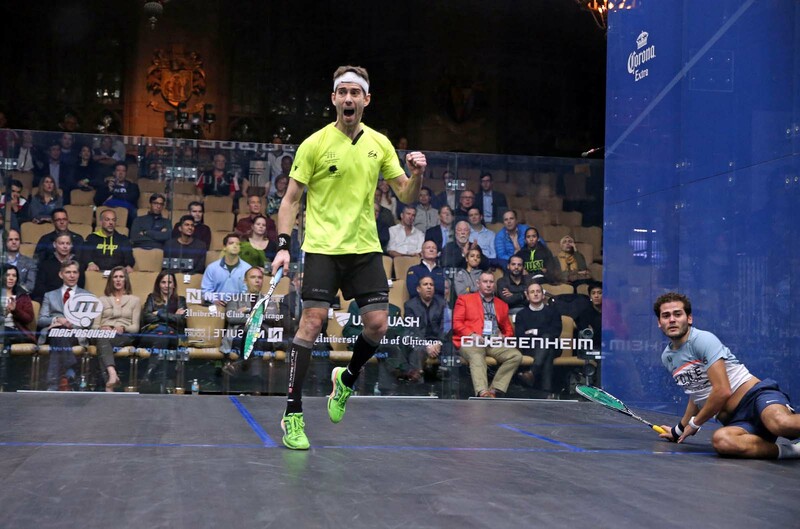 Coll then raced into a 3-0 lead in the fifth but ElShorbagy mounted one more charge, managing to squeeze the decider 11-7 to set up a second round encounter with Mexican Cesar Salazar - the man who knocked him out of last month's Motor City Open in a shock first round defeat. "It was a very tough match today - Paul is a great player," said ElShorbagy. "I thought it was a very fair but very hard match. I think we both played it in the right spirit and maybe it was a bit of experience that got me through in the end. "It was very tough mentally today. My season has been very up and down and it's been hard to understand what exactly is going on. I was fighting myself today as well as him. "I lost in the first round of my last tournament and today, having been 2-0 up and then going 2-2 and 0-3 down in the fifth, I was thinking it's time to go home. But I told myself to push so to win that fifth game is something I'm very proud of." 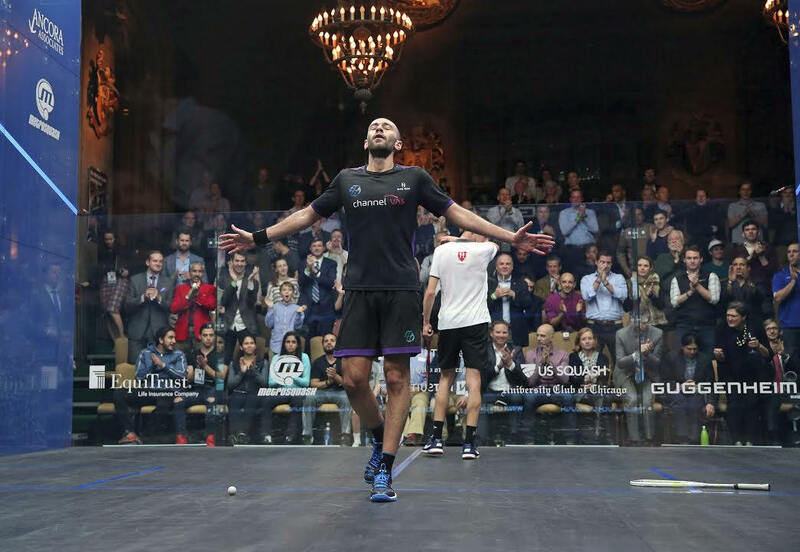 ElShorbagy was joined in the second round by domestic rival Ramy Ashour, the mercurial three-time World Champion making his first competitive appearance since injury saw him limp off court during the 2016 World Championship final. Ashour failed to take to court in December 2016 or January 2017 but played with free flowing abandon as he hit audacious winners for fun, dominating 37-year-old Olli Tuominen to complete an emphatic 3-0 win in just 23 minutes. "It's good to be back - it's not easy, there have been a lot of ups and downs," said Ashour. "It's hard to find the words to describe what I've been through. Last night I didn't think I would get up and get on court today to play - the more you get injured, the more mental scars you get. "Sometimes its not about winning - now for me it's just about not quitting. I just keep on trying." Ashour will face German Simon Rösner in the second round after he stopped Wildcard Chris Hanson while Stephen Coppinger, Marwan ElShorbagy, Diego Elias and Ali Farag also won their opening encounters. 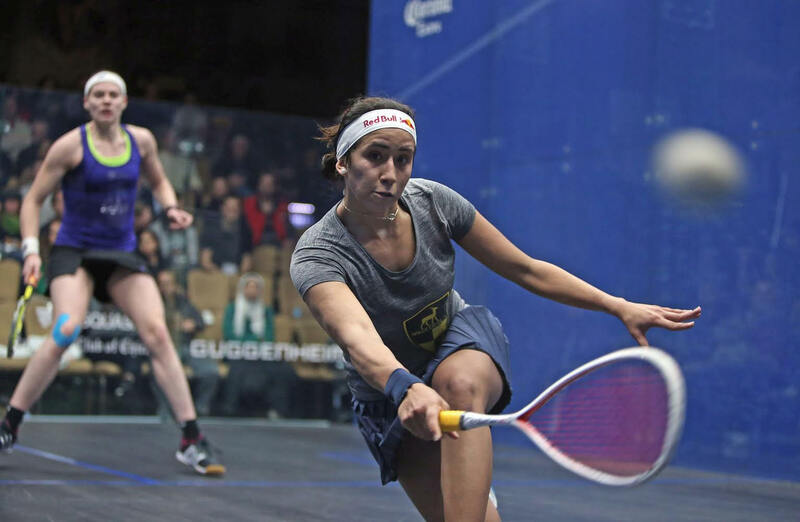 In the Women's draw eight-time World Champion Nicol David, who has won almost every title going bar the Windy City Open, booked her place in the second round after successfully negotiating a potentially tricky encounter with rising Egyptian star Hania El Hammamy. 16-year-old El Hammamy came through qualification to reach the main draw but David's class and ability to withstand repeated attacks were too good and she came through in just under 40 minutes. "I really enjoyed the match," said David - who will now face England's Emily Whitlock for a place in the quarter-finals. "She kept coming back and I just had to keep putting the pressure on her. It was very close so I am pleased to come through 3-0. "When I was leading she relaxed and she hit some great winners and I maybe eased off a little as well. I had to step forward again so I'm pleased to be through and into the next round." David was joined by World No.1 Nour El Sherbini, who easily dispatched Nadine Shahin, and the in-form Camille Serme who extended her unbeaten streak to 10 matches in 2017 with a straight forward 3-1 defeat of Heba El Torky. Serme, winner of the Tournament of Champions and Cleveland Classic so far in 2017, will face Tesni Evans in a compelling second round match while Victoria Lust, Alison Waters and Joey Chan completed the winners on day one. 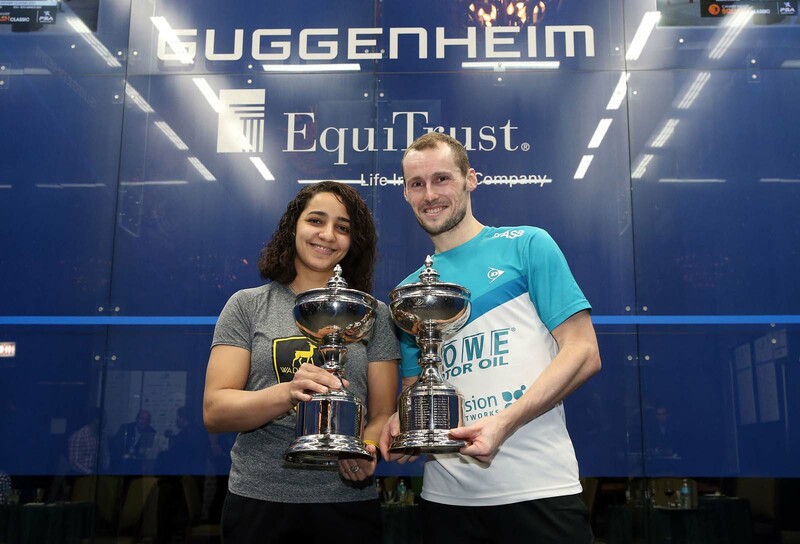 Number one and two seeds Gregoire Marche and Nafiizwan Adnan, along with number two seeded woman's qualifier Coline Aumard, crashed out of the 2017 Windy City Open presented by Guggenheim Partners & EquiTrust Life Insurance Company as qualification at the PSA World Series tournament reached a conclusion today (Feb 22). Top seeded Frenchman Marche was in total control as he moved into a seemingly unassailable 2-0 / 5-2 lead over Egyptian Karim Ali Fathi. 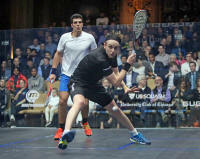 But the World No.26 lost his focus, allowing Fathi to steal a game, and subsequently the match. Fathi, World No.41, will now face Marwan ElShorbagy in the first round. Adnan meanwhile fell 3-2 as Finland's Olli Tuominen rolled back the years, with the 37-year-old twice going ahead before keeping his nerve to seal the decider and set up a first round encounter with Ramy Ashour - the maverick Egyptian who returns to action for the first time in 2017. Leo Au, Lucas Serme, Campbell Grayson, Joe Lee, Alan Clyne and Nicolas Mueller also secured their places in the main draw while in the Women's event, unseeded Canadian Samantha Cornett claimed the headlines with an impressive 3-1 win over Aumard - the Frenchwoman who sits almost 20 places above her on the World Rankings. Cornett will now face World No.11 Joelle King in a compelling first round encounter while there were hard fought five game victories for Mayar Hany, Samantha Teran, Fiona Moverley and Nele Gillis. 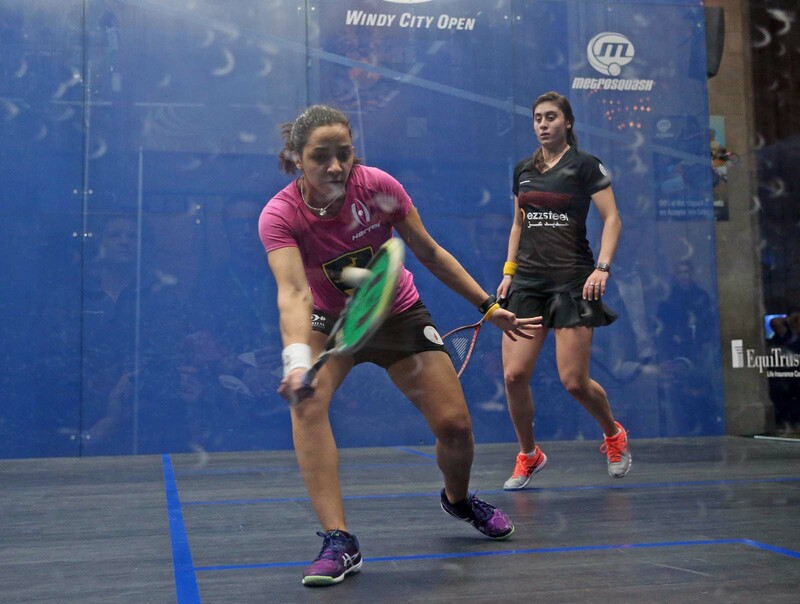 Egyptian trio Hania El Hammamy, Nadine Shahin and Salma Hany Ibrahim completed the list of winners as qualification ended ahead of the main draw which starts tomorrow (Feb 23) at the University Club of Chicago. 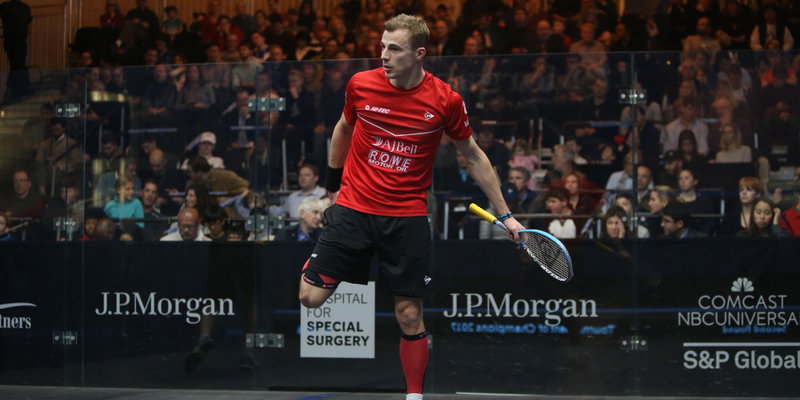 Injury has ruled England's three-time World Champion Nick Matthew out of the forthcoming 2017 Windy City Open presented by Guggenheim Partners & EquiTrust Life Insurance Company. As a result of the 36-year-old's withdrawal Mexican Cesar Salazar moves up from qualification to secure an automatic berth in the main draw – which gets underway at the University Club of Chicago on Thursday February 23 – while Ramy Ashour moves up in the draw to replace Matthew as the number four seed. Omar Mosaad also moves up in the draw and will now face James Willstrop, Matthew's long term domestic rival, in the first round. “I’m very disappointed to miss the Windy City Open but it’s too strong a tournament to compete at when you’re not 100 percent. Unfortunately the ankle has been a little sore and I just need to take a short break from playing to rest it. My focus now is on being ready for the British Open next month and I’m optimistic that I’ll be back competing at the Canary Wharf Classic as part of my preparations for that,” said Matthew.